The following is based upon an article in the Beijing News. The standard assumption is that the publishing company is looking after the interests of the author, especially against rogue pirates who publish unauthorized editions that erode the sales of the authentic edition. In practice, one cannot always trust one's publisher. Several veteran publishers told the reporters here are some typical ways by which the publishers can pirate books themselves. Many publishers and publishing companies deal with foreign authors this way. They pay an up-front royalty, and then they inform the authors that sales went poorly while they were actually privately printing vast quantities. A certain best-selling book was a big hit inside China. The copyright owner hired a Chinese investigative agency to verify the distribution numbers, and found a discrepancy of 100,000 copies from the number reported by the Chinese publisher. The printing plant could be a place where a pirated copy may be produced. For each copy of the book, there are extra pages (5 pages out of 1,000 pages are typically allowed for wastage) can be used by people to compile whole copies that they can go and print at another printing plant. Method 4: The publisher can set up another printing plant. The publisher may collaborate with a private printing plant, and both sides will monitor each other to ensure that the correct number of copies are printed. Meanwhile, of course, the publisher can order additional copies from another printing plant without anyone knowing. 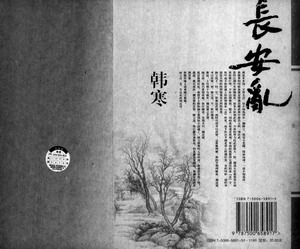 The present case concerns the author Hanhan (韩寒), who has gone public with the situation on his personal Sina.com blog. Hanhan had a contract with China Youth Publishing Company, which asked the independent distributor Xia Juan to distribute the three of his books. The pirated copies were detected by Hanhan himself, and this truly surprised him. 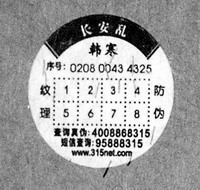 After all, the book Chaos In Changan has a special anti-piracy mark (see photo above). A cursory examination even fooled Hanhan at first. But later, he discovered that the pirated copies even forged the anti-piracy mark. In the authentic copies, there were small strands of string that appeared randomly in the numbered boxes and they can be extracted by needle; in addition, one can call up a special number to determine where those strands ought to appear in particular book with a fixed serial number. In the pirated copies, the small strings were printed directly in fixed locations and cannot be extracted by needle. Apart from that, the books have identical quality. Hanhan was able to find pirated copies in various bookstores in Shanghai, including the Xinhua chain. But he has no intention of suing the bookstores, because they all received the books from the independent distributor Xia Juan used by China Youth Publishing Company. The Xinhua bookstores around the country also had large numbers of pirated copies. Now one would think that it is easy for Hanhan to sue the publisher and/or distributor. Ah, but here we come into a jurisdictional matter. When Hanhan looked around in the Beijing area, he found only the authentic first edition printed by the China Youth Publishing Company. This means that Hanhan cannot file a case at the local Beijing court. If he files outside of Beijing (e.g. in Shanghai), the local court has no jurisdiction over a publisher and a distributor based in Beijing. Cute, isn't it? There is also the matter of the amount of damages. With the assistance of the Shanghai publishing unit, Hanhan has established that the number of pirated copies of Chaos in Changan received from the authorized distributor was nearly 10,000. However, the author acknowledges that he is in no position to run similar counts all over the country. On his blog, Hanhan has announced that he has withdrew the copyrights from China Youth Publishing Company and demands that they cease all printing and distribution. He also urges people not to purchase those three books. He will seek a new publisher and he will have the books published at lower prices. He also hopes that the retailers would return those three books to the distributor. There is a lingering question in that Hanhan is making a public charge against the publisher and the distributor. If the charge is wrong, will he have legal liability? Ordinarily, if China Youth Publishing Company and the independent publisher feel that their reputations have been violated, they have the right to file civil lawsuits. But a blog is a new medium which has not yet been acknowledged to be a mass medium. If the number of viewers to a blog is small, it is hard to say that there was any impact. It will be up to the publisher and the distributor to prove that they suffered real damage. The above was a statement made in a hypothetical vacuum. In reality, the Beijing News picked up the item and reproduced the entire blog post. It is also certain that other blogs such as this one are propagating this story too.